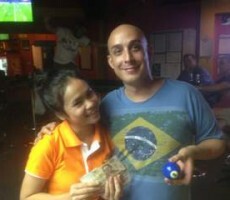 THURSDAY 9 BALL GRAND FINAL : JIMMY WINS. 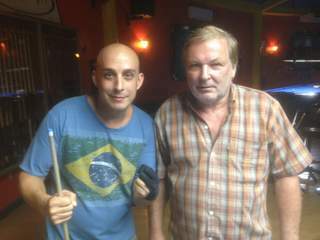 Congratulations go to Jimmy Schmitt (A+2) from Germany for winning our Thursday 9 Ball Grand Final for Season 14 on Saturday night. 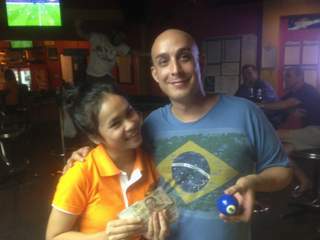 From a full entry of 16 players, he defeated Yu Fluke (A+5) from Brazil in the final of the Double Elimination Competition to collect the 1st prize of 10000 baht. 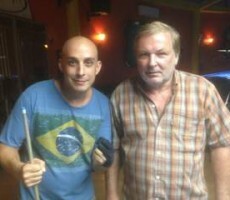 Jimmy played excellent pool throughout the event, remaining undefeated in 5 separate matches, and was a worthy winner. His handicap is now increased to A+3 as a result of his success. Fluke also played very well on the evening. After losing his first match, he won no fewer than 6 consecutive matches on the One Loss Side of the draw to reach the final, before finding Jimmy too tough. 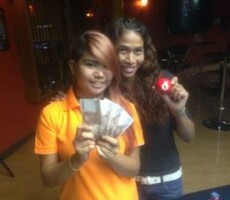 Consolation for him was the Runners-Up prize of 6000 baht. 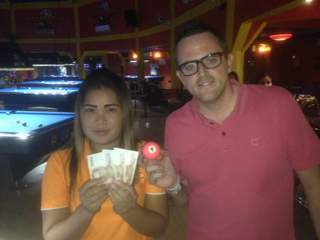 Nok Yung (A+2) from Thailand played well to finish in 3rd place, receiving 4000 baht, with Brooksey Brooks (A+5) from England performing consistently to finish 4th and collect 3000 baht. In equal 5th place were Megabreak’s Barrie Sherman (A+7) and John Weber (A+2) from Israel, each taking home 1500 baht. 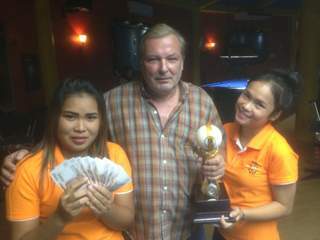 The other money winners on he evening were Russ Exley (A+3) from England and Per Makitalo (A+4) from Sweden, who each received 1000 baht for finishing in equal 7th place. Russ’ handicap now moves up to A+4 as well.